I’ve been trying to take this house room by room, at least in the initial painting and upgrading phase which I’ve dubbed “new builder grade phase”. So in addition to all the painting, I figure I may as well swap out all these little things that just add a nice finished and new touch to each space. I LOVE these doorstops. I know, I know, it seems silly to be in love with a doorstop. But really, I can’t get rid of those brass ones fast enough. I love these new ones for two reasons: 1) They are silver, or satin nickel, or whatever you want to call it (white gold? platinum? shiny gray? lol) which blends in with all my new door knobs (and soon to be hinges once I replace all those as well), and 2) they are essentially one big spring, which makes it so easy to vacuum around (the vacuum just pushes the stop out of the way so you can vacuum under it), and if I accidentally step on or kick one, my toe no longer ends up broken. Installing is easy. 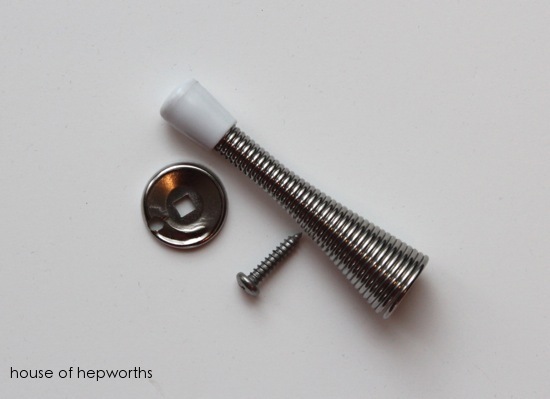 Just remove the old one (it should be screwed into the baseboard, so just unscrew the entire thing), and then screw this new one directly into the old stop’s screw hole. Two seconds tops. It is exactly what it says it is. A doorstop with a magnet on it. 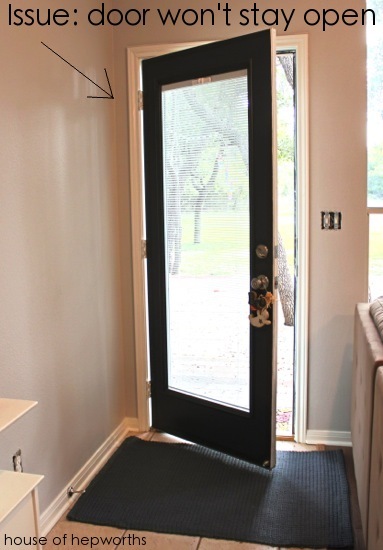 And it’s even fancy because the piece that you attach to your door is slightly spring-loaded so if you slam the door open really quick it will bounce off the doorstop as not to break your door. That’s some fancy stuff right there. So now my door stays wide open. Very exciting stuff over here y’all. Very exciting stuff. Okay, in an attempt to try to not write an entire post devoted solely to doorstops (because that would be lame), let’s talk about those air registers briefly. The house came with the cheapest cheapo plastic air registers that were mostly broken (they wouldn’t open or close, were stuck, and some were even missing chunks of grill), so while the ceiling gets a fresh coat of paint I’ve been adding new nice metal registers. They just make the ceiling look cleaner. 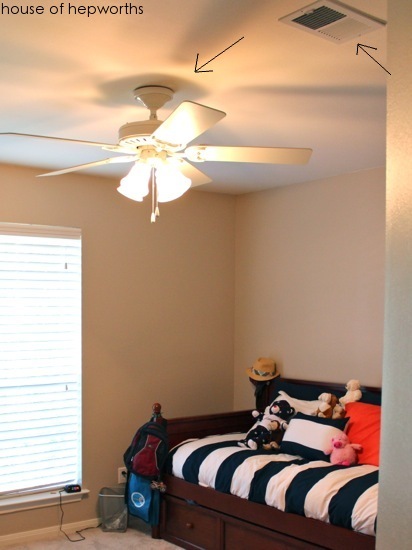 And if you are going to live in Texas, you gotta have a fiddle in the band, er, I mean, you have to have a ceiling fan! It is just too darn hot here to not have ceiling fans. 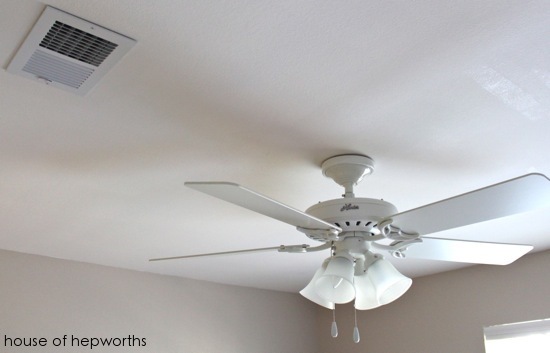 So just like we did in our previous house, we are installing Hunter ceiling fans (I think Hunter is one of the best ceiling fan brands). Fortunately True Value carries Hunter brand fans (yay!) so I happily ordered a few for the children’s bedrooms. I am getting very antsy to start slapping up some moulding and give this house a more custom feel, but I really feel like I need to finish all these basic upgrades first. If nothing else, it helps me feel less anxious knowing the entire house is clean and “new builder grade”. I feel like I’ll have less anxiety doing bigger renovations if I can start with a clean slate. And a special thanks to True Value for providing me with the hardware I need to bring this house into the 21st century. I agree with you! Those little changes really add up! We’ve been in our house 9 years now and are slowly but surely going through the house AGAIN and painting, replacing knobs & hinges…etc. I have those same metal registers, and after 9 years they just looked dingy. A quick spray paint job with glossy white paint made them look brands new again! I have to be honest, I didn’t think I’d be reading all too closely on your post about doorstops, but now I’m glad I actually did! We have the springy ones, but they’re rusted, however, it goes with our decor so I don’t mess. 😉 BUT! I never knew there was magnetic ones! 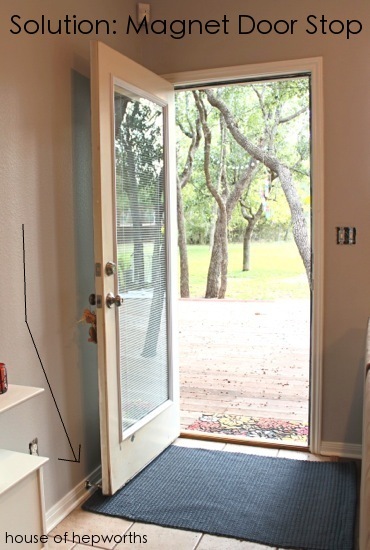 We have a few doors that won’t stay open (laundry room) and I think that’s just what I need! Thanks! Okay, now I’m ridiculously excited about magnetic doorstops! I really need these! The magnetic door stops are great! I had no idea those exited but I need some! 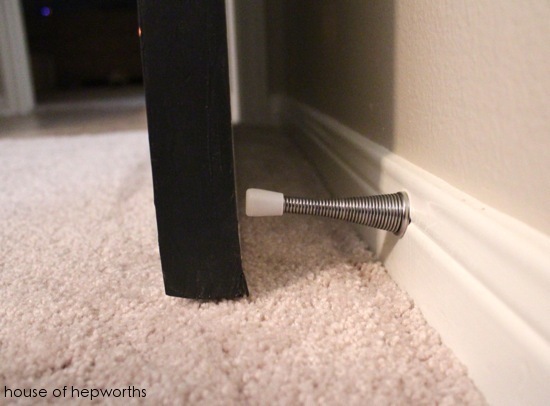 That magnetic door stop is awesome! What a handy thing to have! 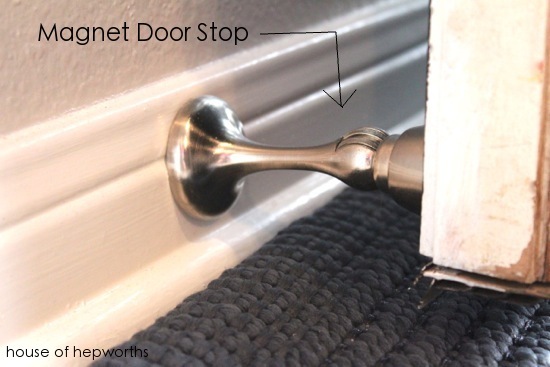 Those magnetic door stops are such an awesome idea! Our son kept pulling off the tops of all our old ones so I had to remove them! Magnetic door stops are a genius idea. Going to get some right now, cause I desperately need them for my room! 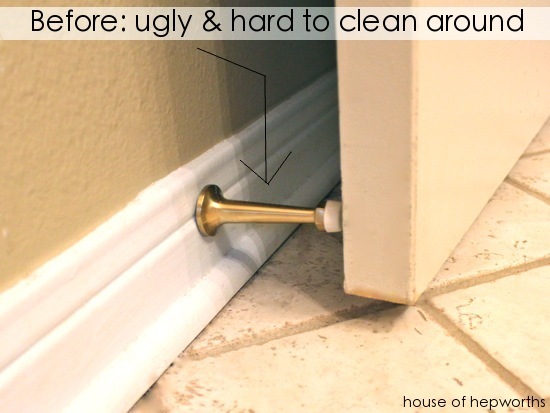 These door stops are life-changing! I read your post and quickly ordered two, and my husband installed them on Saturday. Since there is no light in our pantry, the constantly closing door drove me bonkers. We are also thrilled to no longer need the ancient magazine rack for a door stop in our home office. We have a third door that will stay all the way open or latch closed but will not stay in between. A magnetic door stop will not solve this problem. Why do doors do this? Were they installed wrong? Are they not level? 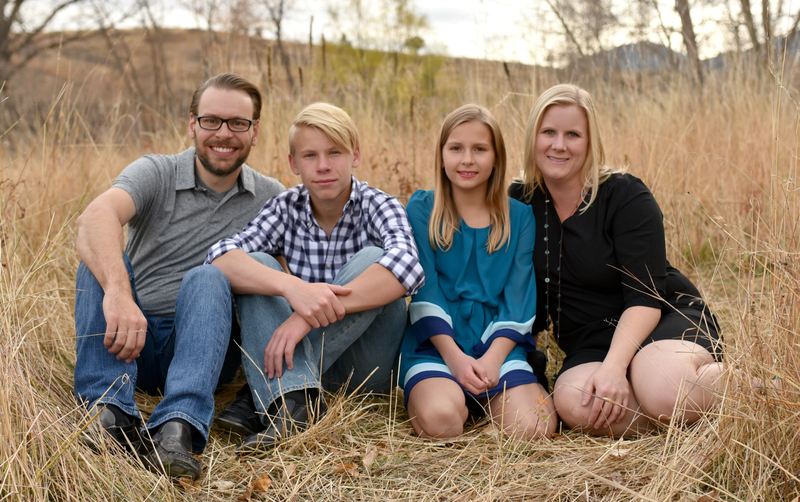 Am I making a mountain out of a molehill? Thanks for sharing this – we love our new door stops!